Ron Howard grew up in Rhode Island where he was a fan of The Machine, a well known Pink Floyd tribute band based in the Northeastern US. Inspired by The Machine, his goal was to create a Pink Floyd Tribute band and tour the world. That vision turned into reality with the creation of Pig Floyd, a hand-picked group made up of the most talented musicians and dedicated Pink Floyd fans he could find. As the front man of Pig Floyd, Ron has shared the stage with headlining acts such as Godsmack, Mudvayne, Seether, Disturbed, Zakk Wylde, Anthrax, Days of the New, Staind, and many more. He has graced the stages of of major venues from the Tsongas Arena to the Tweeter Center, and packed all the smaller clubs in between. Ken Freeland has been a fan of Pink Floyd since he was old enough to hold a guitar. As the lead guitarist for Pig Floyd, Ken’s signature tone and un-mistakable stage presence can’t be ignored. His faithful re-creations of the original music combined with his modern, hard-edged tone create the perfect storm on stage. Ken plays on both Gibson and Fender guitars and uses Marshall amps and heads. Jason Collins hails from Connecticut. Ask him and he will tell you the the universe planted him in Southwest Florida for the sole purpose of taking the role of the bass player for Pig Floyd. His intimidating stage presence and mastery of his instrument both greatly contribute to the band’s stage performance. Jason’s equipment: Lakland bass, Ampeg SVT-Classic bass head and a TC Electronics cabinet. John Kiesling is from Philadelphia and is the driving rhythm behind Pig Floyd. 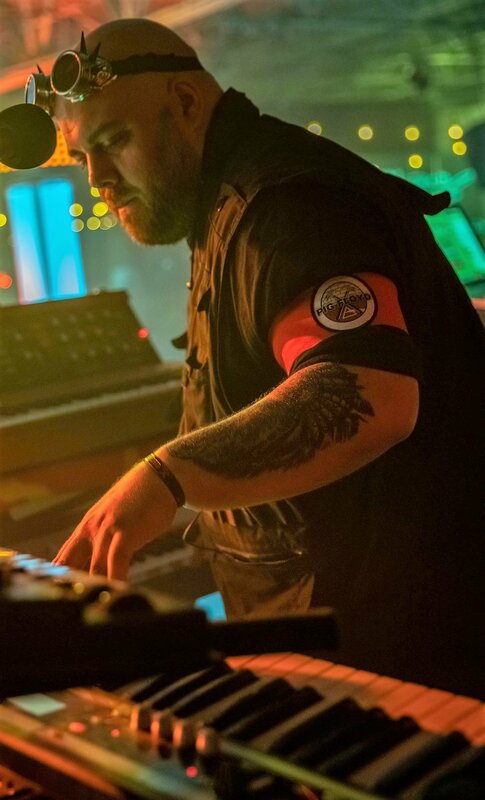 Known for his professional attitude and experience level, he brings solid tempos, a tasty groove and a dynamic musicality to the Pig Floyd experience. As the drummer, John plays exclusively on Drum Workshop (DW) Drums and uses Zildjian cymbals. When on guitar, he plays a Martin acoustic. David “Bear” Delli Paoli was born and raised in New Jersey. An integral part of the band, his talent on synth and keys shines through on the stage. From the psychedelic depths of On The Run to the dreamy keyboard solo in Us and Them, Bear will certainly take you to another time. His gear list is extensive and includes: Moog Model D, Korg X50, MicroKorg XL, Yamaha P90 and a vintage Fender Rhodes. Jenny Van Waes is originally from Ohio where she studied vocal performance at the University of Akron. Her harmonies and backing vocals add just the right amount of flavor to the music that Pink Floyd fans crave. Jenny’s incredibly powerful vocal ability is showcased in the songs Great Gig In The Sky and Bring the Boys Back Home where she brings down the house during every performance. John Conrath grew up in Ohio. He was introduced to Pink Floyd’s The Wall by his uncle Dave when he was 10 years old and immediately became addicted to the music. As Pig Floyd’s saxophonist, he is also a multi-instrumentalist and plays lap steel guitar and percussion. John’s gear: 1962 Selmer Mark VI tenor saxophone, 1999 Keilwerth SX90R alto saxophone, Vito VSP/Yanagisawa baritone saxophone, RPC Mouthpieces, Buffet Crampon R-13 clarinet, Fouke Industrial Guitars lap steel guitars, Hiwatt amplifier, LP Matador congas, Remo Roto Toms, Zildjian cymbals and a Moog Mother-32 Modular Synthesizer. Ron Howard Jr was born and raised in Rhode Island. If you are lucky enough to experience a Pig Floyd show live you can rest assured that you will not forget the laser and light extravaganza that comes with it. Ron is the driving force behind all things lasers and lights. He’s also a talented musician. He plays keyboard and guitar as well as handles the samples that are critical to re-creating Pink Floyd’s vast music catalog. Why are we collecting this information? Thanks for submitting your information. We'll keep you updated with our band's information, show schedule and advanced ticket sales discounts...as well as some goodies you won't want to miss!